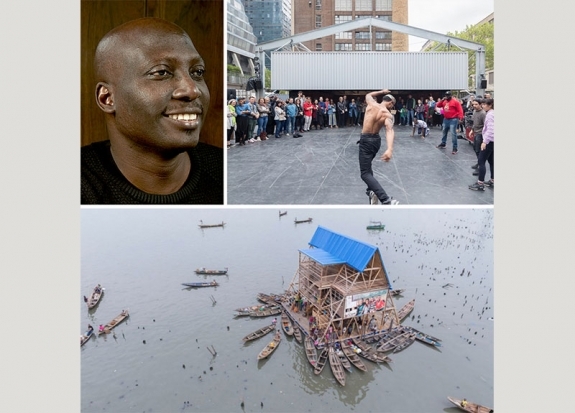 The Architecture/Landscape/Interiors Department at Otis College of Art and Design is pleased to announce the 2018-2019 Donghia Designer-in-Residence Lecture by Kunlé Adeyemi, NLÉ! "KUNLÉ ADEYEMI is an architect, designer and urban researcher. He is the founder/principal of NLÉ and 2017 Aga Khan Design Critic in Architecture at Harvard University Graduate School of Design. His notable works include Makoko Floating School, an innovative prototype floating structure located on the lagoon heart of Lagos, Nigeria. This acclaimed project is part of an extensive research project, African Water Cities, being developed by NLÉ, an architecture, design and urbanism practice founded by Adeyemi in 2010, focusing on developing cities and communities. NLÉ recently launched MFS II, a new, improved iteration of Makoko Floating School, at the 15th International Architecture Exhibition, La Biennale di Venezia, for which it was awarded the Silver Lion Prize. Other projects include Chicoco Radio Media Center, an amphibious community building in Port Harcourt, Nigeria; ROCK, Lakefront Kiosk in Chicago, USA; CDL Head Office in Lagos, Nigeria; and Serpentine Summer House at the Royal Kensington Gardens in London, UK.